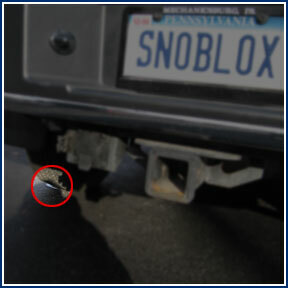 Professional Testing: At SnoBlox-SnoJax we take pride in our product test results. 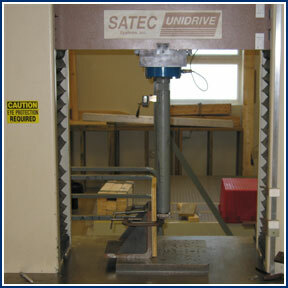 Each model has been tested by Architectural Testing, Inc., the most respected name in building envelope testing. We hope you will agree that our tests are the most practical and conclusive and the results speak for themselves. Click each image for a larger picture. Please take a moment to look over the actual ATI test results. SnoBlox Ace 1449 Lbs. 4849 Lbs. SnoBlox Deuce 1379 Lbs 3456 Lbs. SnoJax I NA (screw down only) 1800 Lbs. SnoJax II 700 Lbs. 3750 Lbs. IceJax I 500 Lbs. 4200 Lbs. IceJax II 1561 Lbs. 6388 Lbs. Metal SnowCatcher NA (screw down only) 3923 Lbs. Mustang SnowCatcher NA (screw down only) 4149 Lbs. SunBurst SnowCatcher NA (screw down only) 3945 Lbs. FleurDeLis SnowCatcher NA (screw down only) 4128 Lbs. 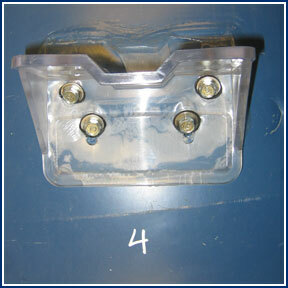 Maple Leaf SnowCatcher NA (screw down only) 4366 Lbs. *The release point on all testing procedures was in the “Method of Attachment”. Note: None of the snow guards cracked in any of the test procedures. The tests performed on each model of snow guard simulate actual and realistic snow loads and weight conditions. We tested each guard by applying pressure via the steel rod, simulating weight, while measuring the force of the load against its face. Our tests simulate actual snow load shear conditions unlike other competitors snow guard testing that pulls upward on the face of the guard, a force that is never found on a snowy, icy roof. We also found it necessary to only perform static laboratory testing since our 21 year unbeaten track record of the SB-190 clearly speaks for itself! The test presses on the face of the guard where the snow load is greatest, simulating real snow load conditions. Please note that all our guards have a forward mounted flat face designed to form a strong holding field across the entire roof to retain the snow & ice until it can safely melt away. We tested both methods of attachment, adhesive mount with SureBond SB-190 and mechanical mount with # 14 SS screws & silicone. We have also tested additional alternative tapes, adhesives and sealants but have not been pleased with the results or longevity of any other variety of snow guard adhesion. 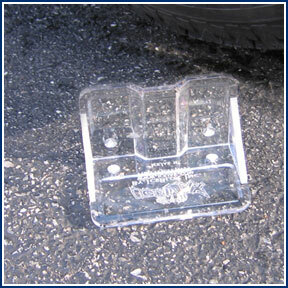 The SureBond SB-190 repeatedly provided optimal holding power and is time proven since we first pioneered its use for our polycarbonate Snojax II snow guards in 1985. 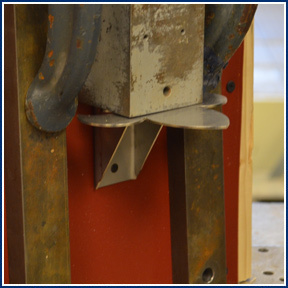 We were impressed to find that when we were done testing, each guard was still intact and the release was directly attributed to screw failure or release of the mounting method, not because of a structural failure by the guard. 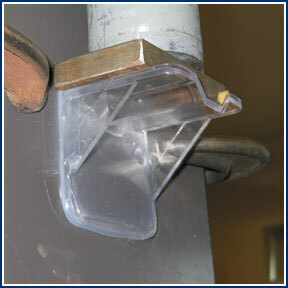 This image was taken after this guard had just held 6388 Lbs, notice how its only disfigurement is where the screws broke and dug into the guard. 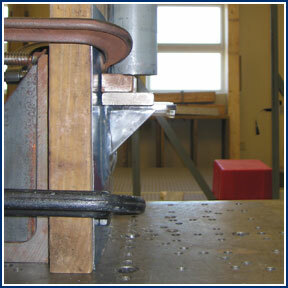 The improved 16 gauge 304 grade stainless steel construction of the Metal SnowCatchers performed very well during testing, each guard was still intact and the release was directly attributed to screw failure or release of the mounting method, not because of a structural failure by the guard. The Other Test. The Truck Test: Although the test itself is impractical and applies forces that a snow guard would never and should never experience, the results once more speak for themselves, plus the test is amusing. We were sure to video tape the truck test so grab some popcorn and enjoy. Once more we put our guards to the test, only this time instead of calibrated lab equipment, we used an F-150. We lowered the truck all the way so that each guard was exposed to the full weight of the truck. 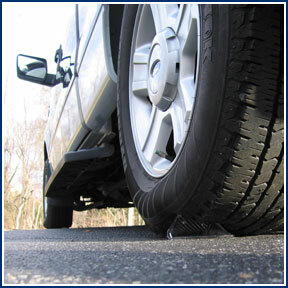 You can see why this test lacks validity as the tire, despite being at full pressure, engulfed the guard. The truck test is as much a test of the tire as it is of the snow guard, fortunately for us, both passed with flying colors. IceJax IIWhen the test was complete and we had lifted the truck once again, each guard was intact and presentable. Although we are glad the truck test went well, we do realize that the forces applied by lowering a truck on a snow guard are unrealistic and impractical. We would like to encourage you to consider the value of professional testing as opposed to the truck test. Our products were designed to work and have been professionally tested, truck tested and field tested to work.